The Southern Oscillation was named in 1924 and its discovery can be traced back to colonial attempts to forecast the Indian monsoon in the late-nineteenth century. 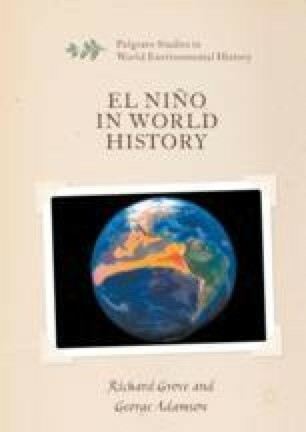 The first use of the name ‘El Niño’ to describe a climatic phenomenon appeared in South America in 1893. The term did not, however, originally mean what it does today, being used to describe a seasonal warm water current that is manifest off the coast of northwestern Peru. The history of these two distinct phenomena and their eventual amalgamation into ENSO is closely linked to the activities of the international Guano industry and to efforts to strengthen US soft power in Latin America during the Cold War. Significant advances in El Niño forecasting have occurred since the 1982 event.